I love the Hebrew word for jam doughnuts. Sufganiyot somehow sounds better in my mind than the English word “doughnut”. Sufganiyot describes exactly what the sweet treat is when you say it out aloud, or at least it does to me. I first heard the word when I spent Hannukah with an Israeli family and every time I see a doughnut I think of the term sufganiyah. These jam filled doughnuts are a traditional treat in Israel leading up to the festival of lights. According to what I have read they are made by cutting a disc of dough and placing jam on the disc and then covering it with another disc, before deep frying. I tried this method and it didn’t work very well for me. I then tried baking them but baked doughnuts just don’t have the same mouth feel so don’t even go there. As much as I don’t like to deep fry anything, you have to deep fry these. However, if you have an airfryer – which is on my wish list – then please try making them using yours and let me know! I deep fried balls of dough and tried to use a piping bag to fill them with jam and that also didn’t work. I now have to add a bakers syringe to my wish list – which as you can see is growing! I did however dust them in cinnamon sugar and forced myself not to devour the lot. For eating and enjoying, I broke them in half and smeared some jam on – much easier in my opinion. Which ever way you serve them, beware, you won’t be able to stop at one. what type of doughnut is your favourite? You can make this dough by hand! I was fortunate to have coaching with Karine. MMM,…what a delectable doughnut recipe! I love this tasty recipe a lot! I’ve learned a new word today…it does have a better mouthfeel like the doughnuts themselves. I like the UAE word too – lgeimat. 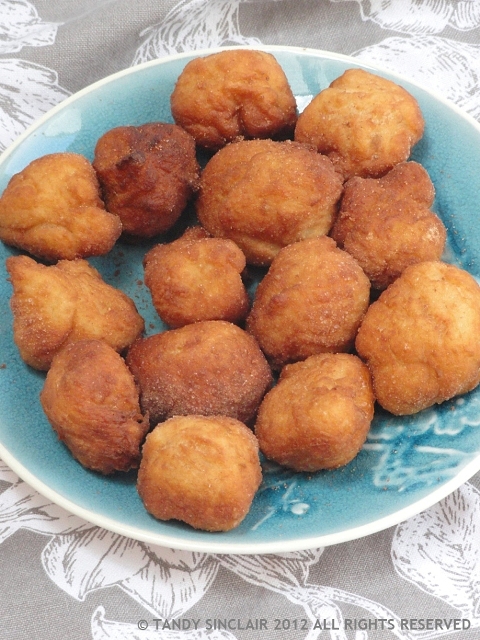 I love doughnuts, I shall try them in the airfryer and see how they turn out. Will let you know. What a wonderful word and memory. Oh, so tempting to make these, Tandy! But I’d eat them…. Lovely post, Tandy! I love them with apricot jam and cinnamon sugar! They look wonderful, my family love doughnuts–i have an eggless recipe that i use–but i agree doughnuts need to be deep fried. I’ve always wanted to try my hand at donuts…especially jam-filled ones! These look perfect! I shall have to look those up! Looks good as my boys love donut holes. They are way more delicious then real donuts. So all of your jams are made with fructose too. Very nice. Oooh, they look good Tandy! Our doughnuts have milk in them as well, it’s interesting to see how this recipe differs from them!